Orlando, Fla.-based Empire Coach Line is equipping its entire fleet with Electronic Logging Devices (ELDs), taking the initiative before the Federal Motor Carrier Safety Association (FMCSA) makes it mandatory for all commercial vehicles. The system, provided by Teletrac, includes features such as vehicle diagnostics; safety analytics to measure, rank and monitor driver safety behavior; a navigation system with live traffic feeds and GPS; electronic daily vehicle inspection reports and electronic driver logs to accurately document all hours of service. The all-in-one, paperless, interactive system is designed to help eliminate human error in logging hours, which in turn aids in better safety for drivers, passengers and other road users, according to Empire. The carrier expects the new technology to increase overall productivity, reduce company costs and promote company compliance with laws related to commercial vehicles. 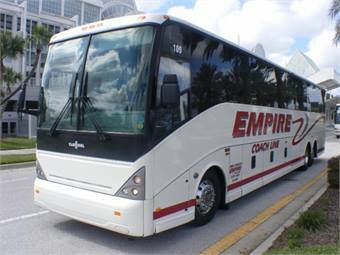 Empire also added three Van Hool C2045s to its fleet, bringing the total number of vehicles in the fleet to 22. These European-style motorcoaches seat 57 passengers and are equipped with amenities, such as TVs with DVD systems, air conditioning, restrooms, extensive luggage space and fully reclining seats. In addition, the carrier also added a 12-passenger Mercedes Sprinter built by Battisti Customs. Key features include Wi-Fi, electrical outlets, rear luggage area, CD/DVD/Stereo System, leather seats and a privacy divider.